I bought my banded brittle starfish about 2 months ago and haven't noticed any strange behavior. I've only seen it a couple of times when I have turned the light on and it immediately went to find cover. I got home from a two day vacation and turned the light on to see 2 tiny baby starfish crawling around. (They are about an inch in diameter maybe 3/4 of an inch and very petite) They look exactly like my starfish, same pattern and colors. I'm very curious to know if she gave birth or if they hatched. How many can she breed at a time? Very excited as I've read they are very hard to get to breed. I'm just curious how many are crawling around my tank! I have read that somethings can look like their babies but I haven't added any rock since I purchased the tank about 6 months ago. So I have recently discovered that I have several baby serpent stars in my filter sponge. Is this common? The funny thing is it's the ones that are brown with black circles on their legs. A species I have never had in my tank. Only two shades of red. Also I have not added a rock of any sort to my tank in well over a year and my last fish was months ago. Thought it was a little weird. Any info? Dear WWM crew, I have 2 questions for you. I have had an Snowflake eel for 6 1/2 years. He was the size of number pencil when I got him. He is now 3 feet long and 1 1/2 inches thick. He has been very lethargic lately and I was wondering how long do they live? My 6 line wrasse has been missing for a week and I believe he ate it. Would that make him sick? Second question. Two years ago I added Bristle Stars to the tank and last week a very strange thing happened. Literally hundreds of Bristle Stars all exited their hiding places at the same time. They climbed to highest points in the tank. They each postured with the center of their bodies elevated away from the rocks and released white mucus in large amounts. They then went back into hiding. What was that? Thanks for your help. Thanks AGAIN WWM crew. Your advice was crucial to saving my reef tank. The starfish spawned simultaneously by the hundreds making my corals and fish very sick. Thanks to your quick advice I was able to save them all. You guys are the greatest. I was first introduced to Brittle Stars only a few months ago. I was given a new Red Sea MAX 130D reef tank system (34 gallons, 29 g aquarium volume and 5 g filter volume) as a Christmas gift, lucky me! I bought all of my live rock from the same LFS, but not from the same batch. I do not remember specifics about the rock, but I do know some of it was from the Fiji area, and the rest was from not too far from there. The first bunch of rock was already cured, as it had been in a store tank at least a few weeks. I waited a few days to buy the rest of my rock, because they were having new rock arrive within a day or two. On one of the newer live rocks I bought from there, I noticed a small star fish when I was trying to arrange the rocks in my tank, already filled with salt RO water. That is my first tank, and still my only tank (though I am oh so badly wanting to take on the project of a large reef tank, maybe around 175 gallons, entirely DIY), so being new to my new absolutely all time favorite hobby, I called the store to not only express to them how excited I was to have this awesome hitch hiker, but to also get some help identifying it. Five arms, none thicker than a toothpick, longest arm no longer than about an inch and a half (maybe two inches, as it's known that in a tank, things definitely look different in size), all arms connected through one rather small disk like center, a very light tan color similar to the aragonite substrate with brown stripes (not dark nor light, a very familiar brown color like a crayon), and of course the bristles along all of the arms. As far as behavior, it really did not want to be out in the light. When I discovered it, it fell off of the rock I was moving, and immediately sought the nearest rock to seek shelter in or under. I was told it was a Brittle Star, and possibly because of the size, may be what is called a Micro Brittle Star (though not by much, it HAS grown since I first discovered it, significant yet not drastic keeping in mind over only about three months time). I asked more about it, and learned that it CAN reproduce on its own, more likely to happen if there is much more than enough food available for it, and that it's quite hardy as it apparently survived being shipped with the new rock out of water. Then, about four to six weeks ago, I simply couldn't resist getting a larger Brittle Star from the other LFS which I now prefer of those I have been to. Very similar to my surprise Brittle Star friend, the larger one differed of course in size (longest arm approximately seven or eight inches), and slightly in color (a light brown color with stripes that sometimes seem to be almost a charcoal gray color but at other times brown just like the small Brittle Star). In the past week, its behavior has surprised me. I feel I am very observant with my tank, I can locate just about anything in there visible to the human eye, with the exception of a hitch hiked bristle worm I have only seen twice (once when I discovered it near the bottom on a rock about two weeks ago, and also last week when I did a serious cleaning session in the tank along with about a 75% water change). However, you don't have to be more observant than enough to know that the Brittle Stars in my tank have never been active in the open when the lights have been on (typical behavior for Brittle Stars as I have learned), to be surprised and excited to see the larger one incredibly active in the light time hours for couple days. Going from side to side in the tank, climbing the glass all the way to the top of the tank a few times, sprawled out just perfect for some pictures (granted the camera used was the one on my cell phone, not to mention the subject of the photos were of course inside a glass aquarium tank), it was a real treat to see it so active. That happened no more than a week ago, and since then, it has remained underneath the rock where the smaller Brittle Star never leaves. I have read that Brittle Stars, as far as reproduction goes, can reproduce sexually, asexually, and through fragmentation. Of course, I've read different statements among various specific species. As I do not know the specific ID names of my Brittle Stars, I have given you the best description I could. If there are more things about the stars I have not thought of that may help you identify them a little better, I would gladly do my best to find answers for you. So finally, to my question (about twenty sentences over due). Would you have any reason to believe, given 1- the surprising behavior recently from the larger star, 2- the physical similarities between the two stars, and 3- the fact that the larger star now doesn't even show more than up to a couple inches of itself at any time from the rock where the smaller star resides, that I may soon discover the stars have made heavenly love (forgive the pun, I just want to add some humor to my enormous message to you, if it's too inappropriate to post online feel free to change it), *ahem reproduced*, and may soon find more Brittle Stars in my tank? Thank you for taking the time to read and reply to my message. Any tips on trying to promote reproduction among brittles? Are Brittle Stars better off in the fuge or display? The display is a 5x2x2 community tank with lots of rock. Fuge space is about 1.5x1.5ft coral rubble and macro. About 2 months ago I bought a lot of livestock from a friend whose tank ruptured. Included was a large Brittle Star (approx 9-10") which I placed in my fuge as a temporary measure. When I tried to get him out again it proved impossible without dismantling the fuge so I left him alone. During this I thought I might have snapped off a leg but couldn't be certain. For various reasons I'm dismantling the fuge this weekend so have the opportunity to put him in the display, or back in the fuge when I'm done. What's considered the best place for these? Also how do these things multiply. 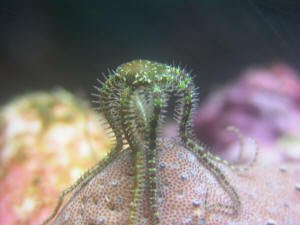 Most recently, I was lucky enough to observe part of a mass-spawning event by a good many Ophiuroid 'micro-brittle stars' in my 75 gallon reef tank and would like to put some comments out there on my observations since a cursory search of WWM and the wider web revealed a relatively small amount of information on the subject. Specifically, the initial reading I did on the subject suggested that these events are triggered in aquaria primarily by 1) water changes and 2) light cycles (if controlled in captivity). The stirring of detritus seems to rate a distant third as a possible stimulus. I believe in my case the stirring of detritus was probably the primary stimulus responsible for triggering the mass-spawn, even though it accompanied a water change. The system has a 29 gallon sump and 20 gallon DSB/Chaeto/fuge/surge tank for a total *water* volume of about 100, maybe 110 gallons. I have pretty strong NNR action going in the system along with a decent skimmer, and find that weekly water changes of only 5 gallons or so along with religious partial changing of carbon and Pura-Pads are enough to keep my water quality very high. I have some tougher (to maintain) corals in the tank that I am attempting, and also a lot of not-so-tough to keep stuff that I like to feed fairly heavily since a) my lighting is not blazing bright by any means and b) some of the animals are aposymbiotic. Part of my coral-feeding routine includes regular stirring of the substrates in all of the system's vessels to suspend detritus to be either eaten or removed by pads or the skimmer. Last week I decided to change about 7 gallons of water--a larger than usual change but still small by any reasonable measure, and performed about two and four gallons at a time respectively, on two consecutive days. On the second day of water changing, I decided to also stir up the substrate in the display area very intensely since it had not been stirred deeply in a few months. I then removed the change water while cloudy--this process intended to be first a 'feeding' and second a 'cleaning'. After completing the water change, I went upstairs and had dinner. When I came back downstairs to the tank about a half hour later, I saw the last ten or fifteen minutes of the Ophiuroid mass-spawn. I do the 5-gallon weekly change religiously, usually with light to moderate stirring of the substrate at the same time, and have never seen a brittle star mass-spawn, but this time with the intense detritus stirring I did. This was about 2-3 hours before lights-out and there were no adjustments made for daylight savings time to my lighting yet (the switch was that weekend). I don't believe light cycles had any role in triggering the event at all. The water change cannot be ruled out as a contributing factor, but this water change wasn't much different from lots of others that came before it--except that I made special effort to stir up a lot of detritus at the same time. I would submit that since some stirring of the substrate is a normal part of water changes for a good many aquarists, it stands to reason that a burst of organics in the water column--not any result of a 'water change' per se--may indeed have been the real trigger here all along. Further experimentation that can shed more light on this question should be easy to design and perform. It would seem that my captive event had a similar timeline to that in the wild recorded in the account linked above, and that I caught the tail-end of the females' broadcast. Unfortunately, I didn't get any good pictures of the event, but WWM already has some very nice shots from another hobbyist that pretty much reflect what I saw, and the account of the incident in the wild is also quite good and comparable to my own experience in terms of the visuals provided (they got some nice shots of [apparently] some female roe broadcasts). My display tank has dozens, perhaps a couple hundred of these small starfish in it, normally only visible for their arms projecting from openings in the rockscape. They came out into full view and stood up for this event. My one large brittle star also had a similar posture up inside the rockwork when I came back after dinner; I think it is possible that it also participated in the spawning with the many from the much smaller species, but I did not actually see that happen. I can provide more details on system history, feeding, and water parameters if you think it will be helpful but my sense is that they are probably not really relevant here. Hopefully this account will be useful, and as always, thanks so much for providing this resource. I owe a lot of success to this website. 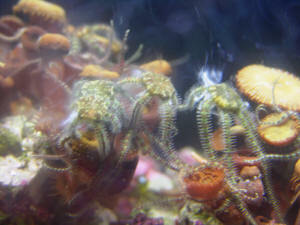 Nature... Brittle Star Reproduction 9/11/07 Good evening crew. <Greetings fellow nature lover.> I had an incredible experience the other day when I came home from church, my protein skimmer was overflowing all over the floor in my house. <Holy water?> We lost about 5 gallons of water, which forced me to do a water change and some tank cleaning. <Yikes! The non-voluntary kind!> When I had completed the cleaning, I noticed about 7 brittle stars (I am assuming the species) <Are micro brittle stars.> had congregated within a colony of button polyps, and others were coming out in other rocks. Within about a half hour of seeing them, they would come to the top of the polyps, would stand up on their legs and started secreting a white liquid from the underside of their body. I am guessing that I was witnessing propagation in progress. <Sure looks like it!> They were gathering in groups and doing this. <Gathering in groups gives a reproductive advantage when broadcast spawning.> I also had two of them climbing the back wall of the tank, one chasing the other and secreting the fluid next to the other one. I have attached pictures of one standing on my toadstool coral and two of the stars on the polyps in a group secreting around each other. I thought this might help others who are seeing this as well and hope that you can affirm or correct my assumptions. <I think your assumptions are spot on. Very nice photos capturing this potentially procreative moment!> Great site and thanks for your hard work, <Is Bob's blood, sweat and tears with many ancillary providers.> its well worth the read when I need the help. <Glad you find it beneficial!